Most people who first venture off into App Development focus their efforts on the design of the App & its implementation. However, when the time to publish the app comes along then there are questions as to which developer program he/she should opt for. Developer programs are online accounts created by Apple for the developer community. Each developer can register their own account from where they can manage the distribution of their apps, the collection of payments for purchase of apps or items within the app. The different programs offered are meant to cater to a specific audience set. There are 4 different types of developer programs. This is the simplest program. Anyone can enrol for this & there is no cost involved. To sign up simply go to developer.apple.com & register. This is the perfect program for those looking to start iOS App Development. It gives the member full access to the latest guides, sample codes & information about the different classes & frameworks used for the current publicly available version of iOS. 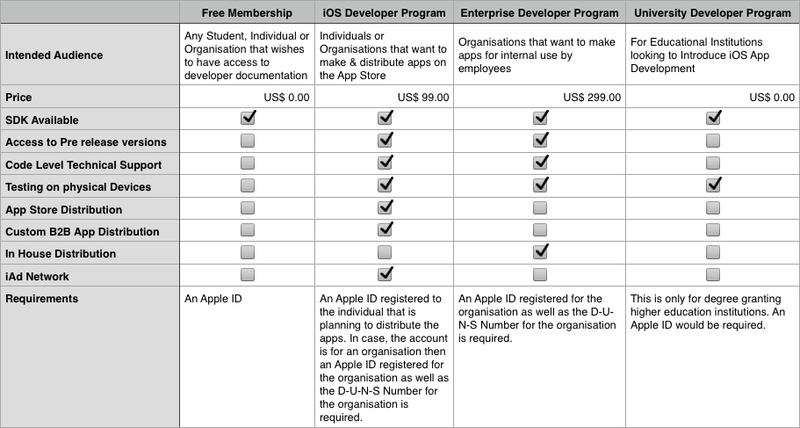 The iOS Developer Program is the paid version of the program. It costs $99 a year & is meant for those who wish to distribute apps on the App store. Apart from distribution it also gives the user options to test it on their own device. All the benefits from the Free Membership are also made available here. The Enterprise Developer Program is another paid program. It costs $299 a year & is meant for organisations who wish to distribute apps within the organisation to their own employees. The big difference between this program and the regular iOS Developer Program is the fact that in the Enterprise Program you have full control over how your apps are distributed to your employees & have to take care of the hosting as well as distribution aspects. The apps made by an organisation do not go onto the app store & are not verified by Apple. The University Developer Program is a free developer program meant for Universities or colleges. This program allows such educational institutes to test the apps made by students as part of the official curriculum. Limited distribution amongst students is also permitted. The program lacks the ability to perform large scale distribution or distribution on the App store. The table below illustrates the different facilities made available to different account holders. Developer Programs, iOS, iOS App Distribution, iOS Developer, Understanding iOS Developer Programs, Which Developer program is for me?